It was only a year and a half ago that 54.5 million Brazilians went to the polls to re-elect Dilma Rousseff in one of the world's largest democratic elections. She defeated a centre-right coalition of parties by a narrow margin and earned a mandate to carry on the legacy of the centre-left Workers' Party, which has been governing Brazil since 2003. But now she has been suspended from office and is to stand trial, accused of manipulating the government budget. And she faces the real possibility of being removed from power in six months. So how did things get to this point - for a president who only three years ago enjoyed 80% approval, according to one poll? 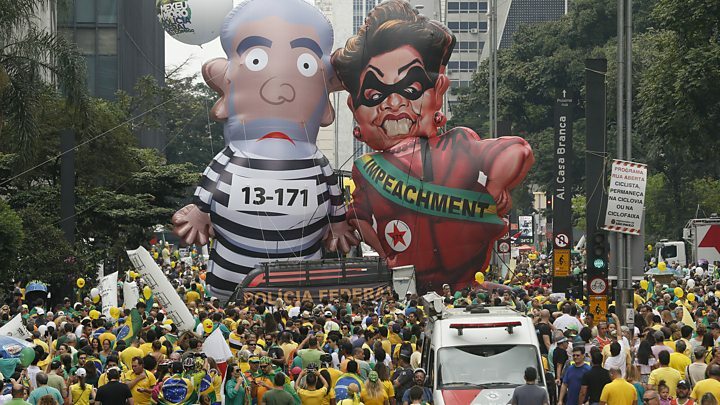 Brazil has seen all sorts of scandals since Ms Rousseff's second swearing-in last January. Virtually the whole political class has been implicated in some sort of dodgy deal. Yet with all the investigations into corruption, one person has managed to keep a fairly clean record - President Dilma Rousseff. Even her opponents tend to acknowledge President Rousseff's reputation as a honest politician. Ironically, she is the one who may end up paying the highest price for many of the scandals Brazil is now facing. Brazil's economic woes started in 2011, when China began to decelerate and Brazilian commodities began losing value in international markets. The country had just come from a decade of solid growth and strong income redistribution. The president and her team treated the decline as temporary and set in motion expensive stimulus measures to keep the nation's finances growing until the global outlook recovered. But China's slower pace became the new normal, and all the measures taken by Brazil's government soon became unsustainable. Despite that, Ms Rousseff won the election by promising to keep the stimulus in place and criticised opponents who said an adjustment - such as higher taxes and budget cuts - was needed. But once re-elected, she single-handedly opted for an aggressive fiscal adjustment, angering those who voted for the opposition and leaving her own supporters feeling betrayed. Making what critics say are bad decisions on the economy is not a crime. But one of the measures taken by Ms Rousseff and her team back in 2014 was deemed illegal by a federal court that analyses federal accounts. The president says this is merely being used as a legal excuse - that her impeachment is nothing but an attempted coup by the opposition. While that debate took place, Ms Rousseff failed to carry out her fiscal adjustment plan. After making cuts to unemployment benefits and ministerial budgets, the economy started contracting at such a fast pace that government revenues decreased sharply. Ms Rousseff's Finance minister Joaquim Levy - who was supposed to carry out her reforms - left his job in December and the government virtually abandoned its surplus targets. The year 2015 was disastrous for Brazil's economy. By early 2016, the country had shed about 1.5m formal jobs. It had had its worst yearly GDP contraction since 1990. Brazil had double-digit inflation - much above the established target - and its debt had been downgraded to junk status by major credit ratings agencies. The economy has been so far the main threat to Ms Rousseff's presidency - an irony for someone who is a passionate economist. 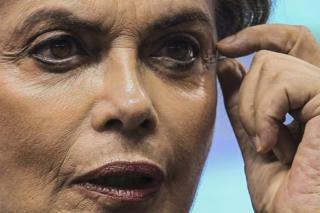 She started her political career as a Marxist guerrilla in the 1970s against Brazil's brutal military dictatorship. In the 1980s, as Brazil became a democracy, she studied economics and played a minor role in local politics in the Southern city of Porto Alegre. Luiz Inacio Lula da Silva - president from 2003 to 2011 - then mentored her into becoming Brazil's first female head of state. Ms Rousseff believes in the role of government in fostering development and regulating markets. She put this belief into practice by redefining rules in many areas of the economy, including energy, oil and banking. Now the president is facing the biggest political challenge of her life. This has been a sharp, quick decline for Ms Rousseff and the Brazilian economy. Climbing back up will be a long, tough struggle.